CHAMROUSSE, France (VN) — At the Tour de France, victories aren’t only measured at the front. They’re measured in the long seconds between first, second, seventh, ninth. At the sport’s grandest affair, it’s about limiting damage, moving up when possible, and keeping skin in the game. That, in short, was Tejay van Garderen’s ride up the oven-hot climb to Chamrousse Friday. Vincenzo Nibali (Astana) countered Alejandro Valverde (Movistar) dazzlingly, leaving a jet wash of general classification riders behind. Van Garderen maintained a steady output, and moved up to fifth overall, 5:19 back of Nibali but right in the thick of podium contention, less than a minute behind Romain Bardet, of AG2R La Mondiale. He finished sixth on the day, 1:23 adrift of Nibali. Van Garderen finished fifth in the 2012 Tour, the same place he finds himself now. The Tour has yet another taxing day in the French Alps tomorrow, with three rated climbs and an uphill finish to Risoul. The Pyrenees loom after, and the final time trial. There are plenty of chances for anyone to either move up or fall down in the remainder of the 2014 Tour. “I am happy to have had a good ride. 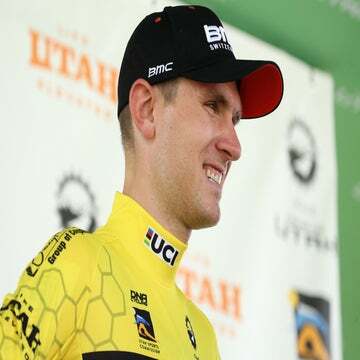 It was a climb that suited to me, so I just tried to stay in my rhythm and I am happy to have moved up,” van Garderen said. Rather than respond to Valverde’s sharp move — easily marked by Nibali — van Garderen kept inside himself, often dragging a large group to the line. Rather than push van Garderen along, the directors let him recover from a tough spot and establish a sustainable pace. When Richie Porte (Sky) lost contact, Sciandri said, the group opened up. “… A lot of people looking around. So we just took it easy. We didn’t say nothing till he was actually turning around because everybody kind of opened up … You just try and put yourself into his thinking, you know? That’s what we try and do,” Sciandri said.